18 months? Holy Sch ... I think what they make is cool! Great that finally a real distillery with Scottish equipment in Germany is available. I had the White Dog in the glass first, so it's amazing how little of the malt note is left. Nose: restrained, even almost nothing comes out of the glass, I would have expected more. A little fresh American white oak, faint caramel, a little spiciness with mild pepper. Fresh, not quite ripe pears and apples like a Granny Smith and Seagrass Lemon Apple. Mouth: now comes the Brennereicharakter of New Make, quite short but noticeable licorice, a very small touch of oak. Quite soft, like the new make, but not so characteristic anymore. Here is the influence of the barrel, there should still something eichic-spicy and ex-Bourbon typical purely, but there is still plenty of room. In the meantime there is still a little old fruit from an oak barrel. Finish: short, between sweet, malty and a little spicy. He does not stay long. This is really a direction that I like in pure ex-Bourbon Fassreifungen, nice fruity, neat vanilla. Good drinkable and this young funny miscarriage, which I often find in other German whiskeys, is far and wide not felt. Let's see how it goes on. The unbridled, a little oily sweetness continues and immediately fills the entire mouth. I mean to drink sweetened fruit salad;) caramel notes are there too. The alcohol does not have a chance (yet), it's a bit titillating when swallowed, but I would not have typed 47% in life. The youth dominates clearly. Second sip: Yes, now the alcohol speaks up and takes a breath in his mouth and throat. Lo and behold: Now I have a little bit of bitterness from the oak. Medium long, very nice and pleasing, mostly sweet - delicate oak note. Still very young and sparkling on the palate. Has some fruit brandy, not necessarily my case ... maybe then in a few years? Nose: the new make is still quite loud (but that was to be expected with an 18 month old spirit), bright fruits (pear and mirabelle plums), some aniseed and caraway, lots of vanilla ice cream, malty sweetness, slightly sourish wood. The influence of the barrel is clearly noticeable but not yet dominant - nor determines the (delicious) New Make the character of this bottling. Taste: strong (47% and youth are noticeable), becomes very soft and creamy with notes of caramel candy, pear compote with vanilla ice cream, again this typical malty sweetness and back in the short finish a pleasant cumin seasoning and yes a touch of oak. 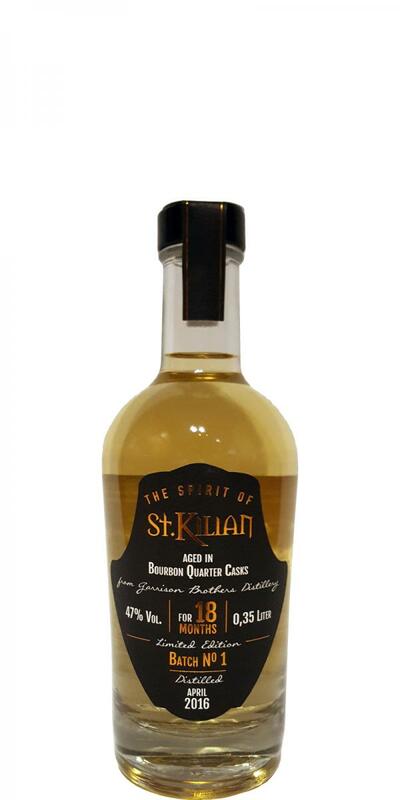 The vanilla and creaminess is the most striking thing that has brought the Quarter Casks in the spirit. He is very delicious and tasty for so young stuff. Jo - they are on a very good way. I hope, however, that they will not beat everything at the age of three but mature a bit longer. This one needs his 5 years to be really great!